The sitar is an adaptation of the ancient Indian vina, with influences of the Persian sehtar of the Moghul courts. The body of the sitar is made of gourd and its neck and face of teakwood. The instrument has movable frets with seven main strings made of steel, copper and brass on the upper bridge. The thirteen sympathetic strings underneath are tuned to the scale of the raga. 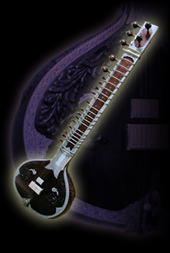 Krishna Bhatt's sitar was made by the late Hiren Roy of Calcutta, the premier sitar-maker of India. 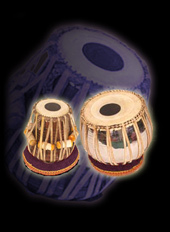 The tablas are two tuned drums, each with a gab - a circle of iron fillings on the center of the head. A good set of tabla can be nicely tuned, has a clear ring, and produces beautiful tones of many types. Tabla literature - the music which has been composed by generations of great tabla maestros of different gharanas (traditional schools) can justly be compared in its variety to the piano literature of the West. The tamboura provides the drone background. Perfectly tuned, it sets the mood of the improvised melody of the instrumentalist. It has four to six steel and copper strings that are played continuously throughout the performance.